Under the Renewable Energy Directive (RED), Member States must achieve targets on the share of energy from renewable sources in their gross final consumption of energy in 2020. These targets range from 10 % to 49 %. To ensure progress towards 2020 targets, the RED also sets indicative trajectories for the period from 2011 to 2020. Member States have also set their own estimated trajectories in their national renewable energy action plans (NREAPs) reported in 2010. In all Member States except one (the Netherlands), the average share of renewable energy sources (RES) for the 2013–2014 period was equal to or higher than the average for this period based on the indicative trajectories set under the RED. According to preliminary European Environment Agency (EEA) estimates, in 2015, the RES share in three Member States (France, Luxembourg and the Netherlands) was below the 2015–2016 share set in their indicative RED trajectories. With regard to the progress of Member States based on their own plans, 22 (all except France, Ireland, Malta, the Netherlands, Poland and Portugal) reached or exceeded their anticipated NREAP trajectories in 2014. According to preliminary estimates, this number decreased to 19 Member States in 2015, as nine Member States were unable to follow their NREAP trajectory for that year (the same countries as in 2014, in addition to Belgium, Luxembourg and Spain). In nine Member States (Bulgaria, Croatia, the Czech Republic, Estonia, Finland, Italy, Lithuania, Romania and Sweden), the proportion of RES use in 2014 already exceeded the 2020 RED targets. Preliminary data indicate that this may have risen to 10 Member States, including Denmark, in 2015. Excess RES capacity may be used for transfers to support Member States that are having difficulty reaching their targets. The trading options provided for under the RED could provide benefits to involved countries and help the European Union (EU) to achieve its 2020 RES target more cost effectively. In order to achieve the European Union’s (EU’s) objective of a 20 % share of energy from renewable sources in its gross final energy consumption by 2020, the Renewable Energy Directive (RED) sets national targets for each Member State for 2020 (EU, 2009). These targets range from 10 % (Malta) to 49 % (Sweden). To monitor progress towards these 2020 targets, the RED sets indicative trajectories for the period from 2011 to 2020. These indicative trajectories are expressed as average shares for two-year periods from 2011 to 2018, in addition to the 2020 target. For the two-year period from 2013 to 2014, all Member States except one (the Netherlands) exceeded their indicative trajectory set in the RED (see Figure 5.1). According to approximated estimates from the European Environment Agency (EEA), the 2015 renewable energy source (RES) targets set in the indicative RED trajectories will not be met by three Member States (France, Luxembourg and the Netherlands) for the two-year period from 2015 to 2016 (see Figure 5.2). It is still possible that these countries will stay on course with their indicative RED trajectories by achieving 2016 RES shares that are sufficient to bring the 2015–2016 averages above the trajectory values. 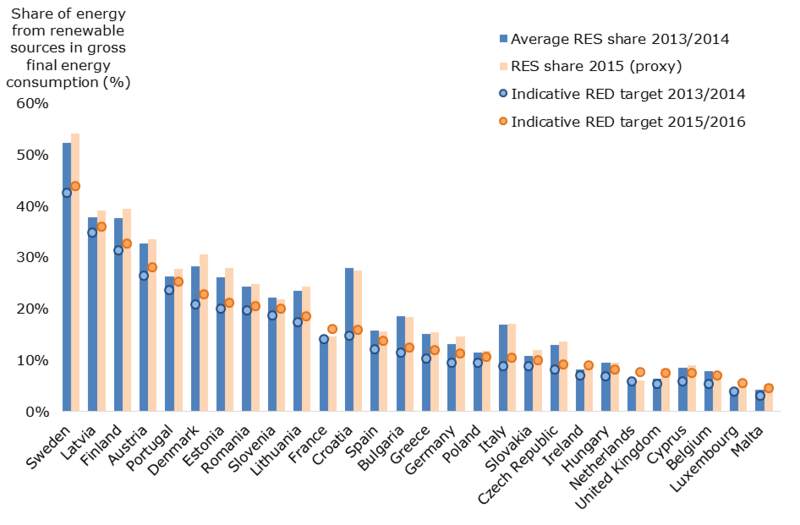 When considering current RES shares in relation to 2020 targets, in 2014, nine Member States exceeded their national targets for 2020 set under the RED. These countries were Bulgaria, Croatia, the Czech Republic, Estonia, Finland, Italy, Lithuania, Romania and Sweden (see Annex 2). According to preliminary estimates from the EEA, in 2015, Denmark also increased its RES share to a level above its 2020 RES target. Note: For Croatia, the share of energy from renewable sources changed considerably because of data revisions which took place in 2016. This revealed significantly higher amounts of biomass consumption which drove the proportion of renewable energy use upwards compared with the 2015 report. Source: EU, 2009; EC, 2013; EEA, 2011 and forthcoming; Eurostat, 2016. Member States also set their own estimated trajectory in national renewable energy action plans (NREAPs), which they reported in 2010. These action plans concern the development of renewable energy at the national level, and include indicative trajectories as well as planned RES shares in the transport (RES-T), heating and cooling (RES-H/C), and electricity (RES-E) sectors. For most Member States, the anticipated trajectories set out in NREAPs are more ambitious than the indicative trajectories defined in the RED (). For example, the indicative RES target for the 2013–2014 period set out in the RED for Denmark is 20.9 %, while this country planned to achieve a share of 27.3 % for energy from renewable sources in 2014 according to its NREAP. By contrast, Greece, Latvia, Romania and the United Kingdom have designed trajectories in their NREAPs which are, for some years, lower than those set out in the RED. 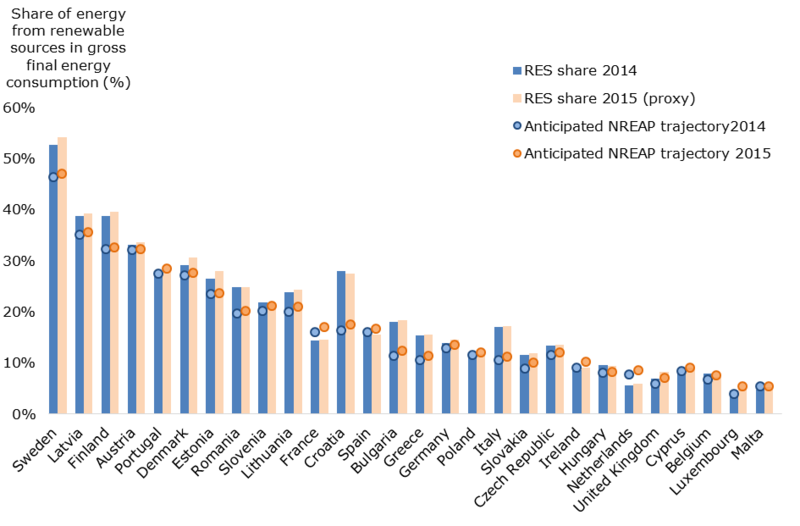 In 2014, 22 Member States reached or exceeded the RES targets outlined in their NREAPs for that year (see Figure 5.2). However, for six Member States (France, Ireland, Malta, the Netherlands, Poland and Portugal) in 2014, the RES shares were below the anticipated trajectories laid out in their corresponding NREAPs. Preliminary estimates by the EEA indicate that, in 2015, fewer Member States exceeded their NREAP trajectories than in 2014 (19 compared with 22). In addition to the countries that did not reach their NREAP trajectory in 2014, four Member States (Belgium, Luxembourg, Poland and Spain) failed to stay above their trajectories in 2015. Note: The countries are ranked by decreasing 2020 RES target levels. For Croatia, data on RES proportions were considerably different from those used in the 2015 assessment. This data revision, which took place in 2016 revealed significantly higher amounts of biomass consumption, which drove the proportion of renewable energy use upwards. The growth in the proportions of RES use in Member States during the 2005–2014 period is a combined result of the development of renewable energy use (in absolute terms), together with the decline in gross final energy consumption, in 27 Member States (see Figure 5.3). If gross final energy consumption was to increase without further RES deployment, the proportions of RES use would actually decrease. Note: In Malta, there was an increase in gross final energy consumption from renewable sources of 4 193 % between 2005 and 2014. Because of its absolute small size, however, the data may not be fully representative and are thus not represented above. The data on total gross final energy consumption take into account adjustments with regard to the amounts of energy consumed in aviation, as stipulated under the RED. Source: Calculated from Eurostat, 2016. The 10 % RES-T target at EU level translates into RES-T targets of 10 % for all Member States. In 2014, Finland (21.6 %) and Sweden (19.2 %) were the only two Member States with RES-T shares of more than 10 %. In the other Member States, RES-T shares varied from 0.2 % to 8.9 %. In Finland, the use of biofuels compliant with sustainability criteria () increased significantly in 2014. In Sweden, fuel efficiency and renewable energy use in transport are stimulated through a number of tax incentives. Sweden has a high proportion of flexi-fuel vehicles, and numerous public buses run on ethanol and biogas. Sweden also has a high proportion of renewable electricity consumption in rail transport. In 2015, the situation remained similar to that in 2014 according to approximated estimates. Apart from in Finland and Sweden, RES-T shares ranged from 0.2 % to 8.3 % in the other Member States (see Table A2.2 in Annex 2). According to the latest progress reports on renewable energy submitted by Member States in 2015, 15 Member States (Bulgaria, Cyprus, Denmark, Estonia, Germany, Greece, Hungary, Ireland, Italy, Latvia, Poland, Romania, Slovakia, Spain and Sweden) expect to produce more energy from renewable sources than planned, for at least one year, before 2020 (). These Member States could, in principle, transfer any excesses to other Member States experiencing deficits. Several Member States have indicated that they would be willing to participate in such transfers. In 2012, 2013 and 2014, statistical transfers between Norway and Sweden took place (Eurostat, 2016). Norway and Sweden created a joint electricity certificate market in 2012; according to this scheme, an electricity certificate issued in one country can be used to meet the quota obligation in the other country, and vice versa. Denmark, Germany, Latvia, Lithuania, Luxembourg and Portugal have also reported plans of joint projects or have expressed an interest in such projects. Denmark expected to establish a cooperation agreement with Germany in 2016, regarding the mutual opening of tenders for solar cells for plants located in the other country. In Germany, some tenders will be opened up to cross-border participation by foreign plants. In 2016, Latvia was planning to consider quantity and cooperation opportunities for statistical transfers of energy from RES in 2020. Lithuania signed a memorandum of understanding with Luxembourg in 2011 concerning cooperation on energy from renewable sources, including opportunities for statistical transfers and joint projects. Luxembourg reported that no final decision on a statistical transfer or a joint project had yet been taken for the 2013–2014 period, but has held and intensified target-oriented talks with various countries. Portugal registered an expression of intent to develop a joint project in the area of photovoltaic technology, but no agreement has been made so far between Portugal and other Member States. In its 2015 progress report on the promotion and use of renewable energy from renewable sources submitted under Article 22 of the RED, Italy presented an updated RES trajectory, because of the unexpectedly quick development of the use of renewable energy compared with that expected in the 2010 NREAP. This was a consequence of the reduction in total final energy consumption and of the greater than anticipated increase in power generation from renewable sources. Such development is expected to continue until 2020. For the present assessment, the original NREAP trajectory was taken into account. Only biofuels and bioliquids that comply with sustainability criteria defined at EU level can receive government support or count towards national renewable energy targets. These criteria ensure that the use of biofuels (in transport) and bioliquids (for electricity and heating) is done in a way that guarantees actual carbon savings and protects biodiversity. In particular, to be considered sustainable, biofuels must achieve minimum greenhouse gas savings in comparison with fossil fuels: they cannot be grown in areas converted from land with previously high carbon stock, such as wetlands or forests, and they cannot be produced from raw materials obtained from land with high levels of biodiversity, such as primary forests or highly biodiverse grasslands. Excesses and deficits are reported in Table 7 of the progress reports on the promotion and use of renewable energy from renewable sources under Article 22 of the RED. EC, 2013, ‘National action plans’, European Commission (http://ec.europa.eu/energy/renewables/action_plan_en.htm) accessed 14 October 2016. EEA, 2011, ‘National Renewable Energy Action Plan (NREAP) data from Member States’, European Environment Agency (http://www.eea.europa.eu/data-and-maps/figures/national-renewable-energy-action-plan) accessed 17 September 2015. EEA, forthcoming,Renewable energy in Europe 2017 — Recent growth and knock-on effects, European Environment Agency. EU, 2009, Directive 2009/28/EC of the European Parliament and of the Council of 23 April 2009 on the promotion of the use of energy from renewable sources and amending and subsequently repealing Directives 2001/77/EC and 2003/30/EC (OJ L 140, 5.6.2009, p. 16) (http://eur-lex.europa.eu/eli/dir/2009/28/oj) accessed 14 October 2016. Eurostat, 2016, ‘SHARES 2014 results’, Eurostat (http://ec.europa.eu/eurostat/documents/38154/4956088/SUMMARY-RESULTS-SHARES-2014.xlsx/04529edf-13f5-464a-9993-df7a09aee3a9) accessed 14 October 2016. For references, please go to https://www.eea.europa.eu/themes/climate/trends-and-projections-in-europe/trends-and-projections-in-europe-2016/5-progress-towards-member-states or scan the QR code.